» PC Reviews » CYBERPOWERPC Gamer Xtreme VR GXiVR8060A5 Review, Is This The “Sweet Spot” Gaming PC? With the small handful of exceptions when certain pre-built rigs go on a nice sale, pre-built PCs like this one aren’t built with power per dollar spent in mind but instead of creating a profitable computer to sell which makes complete sense. Before getting into the hardware specs and explaining what this PC can and cannot do I want to make sure you understand that you’re paying a bit of a premium to have the PC built for you. To be honest that could be exactly what you’re looking for if you don’t have the time to put a PC together yourself or maybe you haven’t given it a thought. Later on in the review I’ll be comparing this PC to a rig you can build for around the same about. Putting together a custom $800 PC build compared to this would yield with most of the parts being better. With that said, this is still a completely viable gaming PC if you’re not interested in building your own. The main factors in any gaming PC’s level of performance in games is the video card and processor combination. The more powerful this combo, the better it’s going to run higher demanding titles. The i5-8400 was created with high quality gaming in mind. For the CPU this is using the Intel Core i5-8400 processor. This is an excellent, 6-core gaming processor. CPU speed comes to 2.8GHz and it’s not unlocked so it’s not going to be able to be overclocked with regular methods, probably not at all. Even though an overclock isn’t possible, which makes a processor run a bit faster than what it was intended to run at for further performance, it’s still a great processor for all of today’s games at 1080p. 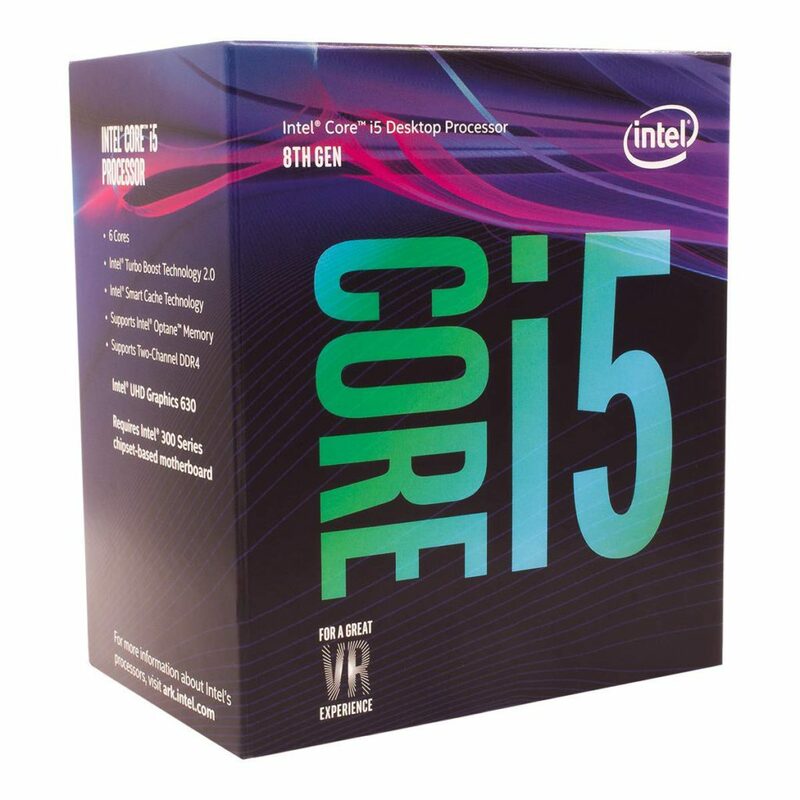 What the i5-8400 isn’t meant for is being an optimal workstation choice meaning that if you’re into streaming, creating videos and/or rendering a lot of images & videos then there are processors that are better for those types of things. That’s not to say that this PC isn’t capable of streaming or rendering at all, it definitely can at a mid-level! But don’t be expecting to be able to stream Black Ops 4 at ultra settings and having a high quality stream all together. You also shouldn’t expect this type of processor to render videos and graphic design projects at super fast speeds. It’ll still be able to render video and what not, just not at an optimal speed. It wasn’t made for workstations, it’s 100% meant strictly for gaming. VR gaming and all of today’s games will be entirely playable. In terms of CPU performance, it has a while yet before it were to become obsolete so there is some future proof power here as well. But you can’t just have a good processor for games, you’ve also got to have a video card that matches up and brings it all together. 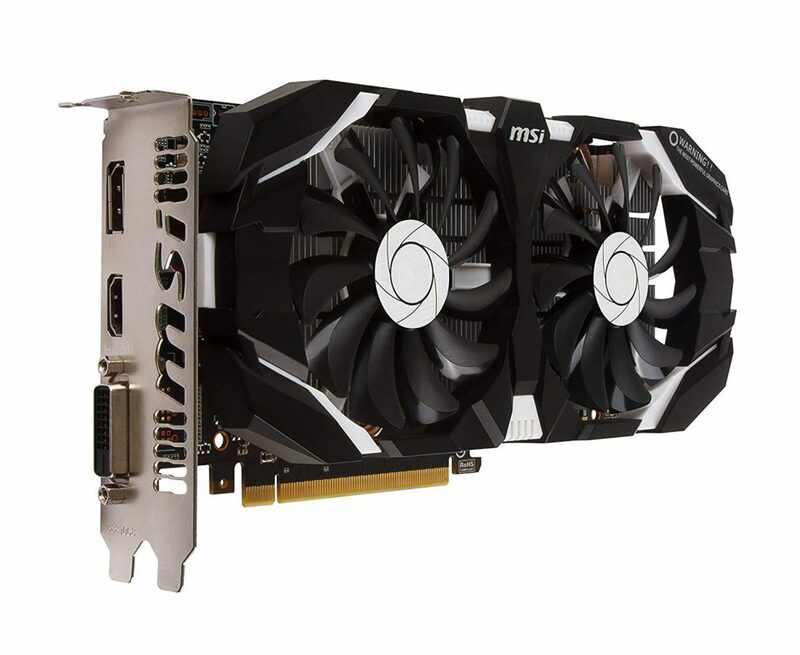 Some users of this PC claim that the GPU is the MSI GeForce GTX 1060 3GT OC edition, though I’m certain that CYBERPOWERPC uses whatever is available at the time. This rig uses a GTX 1060 3GB video card which is an ideal card for most titles at 1080p/60FPS. I say most because certain titles aren’t going to be able to run at 60FPS at all times. General game optimization needs to be thought of as well. A Intel Core i5-8400 CPU combined with a 3GB GTX 1060 GPU is a great combo for 1080p, ultra settings on most games and 60 FPS. If you’re considering getting a G-SYNC monitor, a monitor with higher than 60 refresh rates or a monitor with higher resolution than 1080p… you shouldn’t. This type of PC is not meant for 144hz or 1440p/4K gaming. 3GB of video memory sounds a little iffy when thinking of VR… But I’ve seen 3GB variants of the 1060 being used with the Vive before and the performance level works for it. You aren’t going to run VR games at ultra settings mind you, but it’ll get the job done with a mid level preset. All in all, the GPU and CPU combination here is great for 1080p gaming. You’ll get a consistent 60 FPS with almost every major title on the market today and it’ll stand the test of time for a good while. I’d say within the next few years you’d want to at least consider upgrading the video card. Now onwards to all of the other hardware specs inside of this PC. You can have an awesome processor and video card but if you don’t have a high level of quality going on with everything else then it isn’t going to matter in the first place. This also has 8GB of DDR4 RAM, a 120GB solid state drive, a 1TB HDD, a 500W power supply, a wifi adapter built-in, Windows 10 pre-installed and a basic keyboard/mouse combo to boot. 8GB of RAM is the standard. It really doesn’t matter what type of video and processing power you have, if you don’t have at least 8GB of memory then you’re not going to be able to run today’s main titles. RAM is responsible for multi-tasking and temporarily storing data. This is needed when there is a bunch of information going on at once, such as flying through an open-world game with many instances going on at a time. 8GB of RAM will be enough to be able to run a VOIP such as Discord while running your game at the same time. In most instances, you’ll also be able to run a YouTube video in the background as well if you desired to do so. If you wanted to do even more multi-tasking then it’d be wise to add another 8GB of RAM for 16GB total at some point. Just remember that it’ll be best to use the exact model/brand of RAM stick to add in! 120GB of solid state drive space is used for Windows mainly, but there will still be a little room for some games/programs if you wanted to have them on there. SSDs are great for much faster load times. This is why Windows is installed onto it, it’ll ensure that the PC will boot up literally in seconds and whatever else is installed on it will load up at super fast speeds. 1TB of HDD space will be for everything else. Programs that you don’t use as much, games that aren’t your main games and storing other files will fill this up. It should be plenty of space for all of your games. A 500 watt power supply is what is going to power everything inside. This is enough wattage for the rig as is, though if you decided to upgrade to the highest-end hardware then you might want to consider getting a higher wattage PSU as well. Wifi will be possible right out of the box thanks to the adapter that is built-in. It is a 802.11AC connection which will be great if you need to use it. If you’re pretty far away from your router though then I’d suggest going with a direct connection on the ethernet port instead of using wifi. Windows 10 will come pre-installed and a keyboard/mouse combo will come with. Windows 10 is the staple operating system today and it’s the most compatible for gaming, there’s no surprise there. A note about how CYBERPOWERPC handles Windows 10 is that they almost never have any bloatware which is basically pre-installed programs that definitely don’t need to be installed. There won’t be any annoying apps, just a nice bare bones Windows 10 install. As for the keyboard and mouse it’s a normal combo straight from CYBERPOWERPC. On the product page you’ll see that there are options for a keyboard bundle but the “PC only” version definitely comes with a standard keyboard. The keyboard bundle is for a mechanical keyboard promo. You’ll want to upgrade both the mouse and keyboard at some point but they aren’t horrible. The mouse has all of the basic settings and can even switch between 7 colors which is cool. 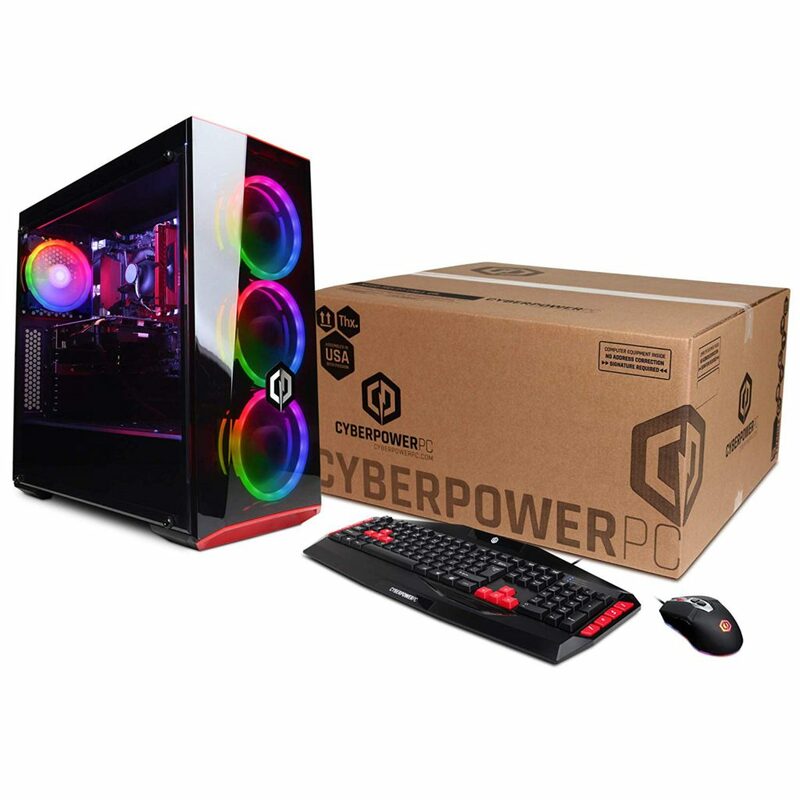 I wanted to dedicate a section of this review to the design choices that CYBERPOWERPC made for this model because you should know what else you can add within the PC as well as getting some more details on the overall design. There is an extra 2.5″ SSD and hard drive mounting slot available so if you were wanting to add in another SSD or have another terabyte of extra space then it’s readily available. There is also a M.2 slot on the motherboard which isn’t necessarily a direct design from CYBERPOWERPC but I figured it’s worth mentioning anyway. The case itself – size wise – comes out to 18.46 x 7.87 x 17.89 in. This is a decently sized case but it’s nothing that’s overly huge. Be sure to check out some of the pictures left from actual users on the product page to get a better idea of the size. Four fans are what keeps this build cool and they can all change colors with a remote. There aren’t any other slots where you’re able to add more fans, however the four that come with will be more than enough cooling. If you were to upgrade down the road and were wanting to add liquid cooling keep in mind that it’s not possible to mount radiators with the design. 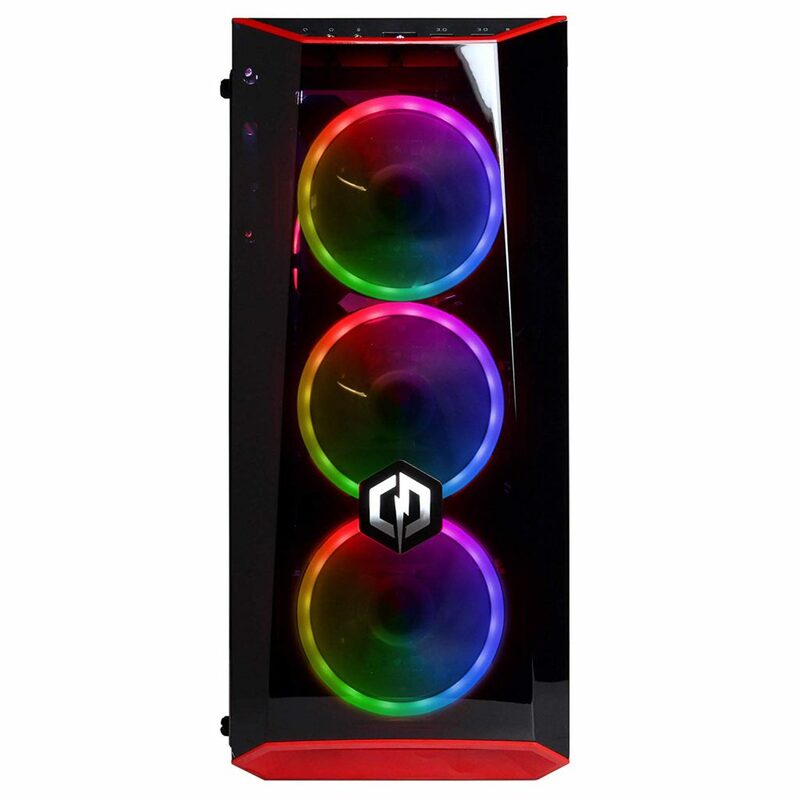 You’ll have to opt for an aftermarket air cooler but there are plenty on the market that will fit this case and provide awesome cooling. There are two USB 3.0 slots on the top-front portion of the case. There is also a headphone and microphone jack in that area if you needed them. On the bottom of the case it elevates quite a bit giving plenty of breathing room for the bottom of the PC. This is essential if you were to put it on carpet this way it won’t overheat. Durability was in mind with the design as well. It’s a sturdy tower that is heavier due to all of the hardware inside and the overall design which is great! Design wise, this is one of the better looking PCs that CYBERPOWERPC currently has available. I really appreciate the way they went about staying at their core while adding in a few extra bonuses such as being able to change the fan colors with a remote. This marks the end of the CYBERPOWERPC Gamer Xtreme VR GXiVR8060A5 review. To sum things up, we’ll go over a list of pros and cons by going with this build and also talk briefly about what building your own rig could be like. Able to handle 1080p/60 FPS gaming with no problems. Case fans can change colors with included remote. Comes with a wifi adapter pre-installed. Includes solid state drive for fast boot/load times. Not able to overclock CPU. 500 watt power supply will need to be upgraded if you decide on upgrading to higher end hardware. Liquid cooling is not possible. Paying a little extra for convenience. If you’re wanting a pre-built right around this price range that will handle 1080p and entry-level VR gaming then this is probably the one you should get. Sure, you pay a bit more than what you would doing a build yourself but it’s not a rip-off by any means. Again, you should look into building your own PC if you haven’t already – in most cases you can spend the same amount and get even better hardware! The only downside is having to learn how to put it together yourself but honestly, it’s not too hard to do. Be sure to check out the reviews over on Amazon as well, you’ll get even more information as well as plenty of customer photos to look through! So, what do you think of the CYBERPOWERPC GXiVR8060A5 gaming PC? Is this the PC you’re going to get? Or are you looking into building your own? Tagged cyberpowerpc, gamer xtreme vr series, gaming pc review, gtx 1060, pre built gaming pc. Bookmark the permalink. 16 Responses to CYBERPOWERPC Gamer Xtreme VR GXiVR8060A5 Review, Is This The “Sweet Spot” Gaming PC? Great review on a nice build Colton. 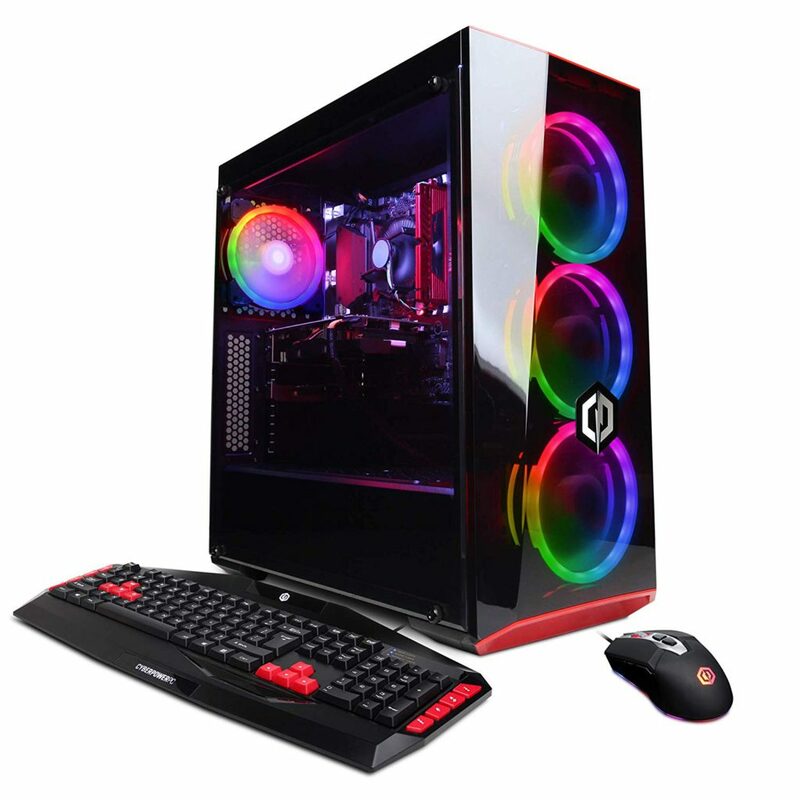 I like this PC but I am looking for one that can work fine with Fortnite as it is for my kids. They had me download the game on my iMac and boy it almost ruined my computer. So rather than trying to ruin my work computer, I was thinking about a nice PC that they can use. What would you recommend for something for Fortnite and for younger gamers? It comes down to the type of performance you’d want the PC to have with a game such as Fortnite. Fortnite is very well optimized so it doesn’t take much to be able to run it smooth enough to enjoy. This PC specifically would be running Fortnite at 1080p resolution with 60+ frames per second meaning that it’d be extremely smooth, even at the highest graphics settings. It’d run it very well for sure so if you’re looking for the smoothest experience, this rig would get that done. Thanks for your review, That is a seriously fun looking machine!Power to boot, the rig and speed seems very good and as you say Virtual Reality gaming and all of today’s games are entirely playable. I know the importance of a solid state drive, so that’s important and it has 120GB of that! How would that compare to a MacBook pro for gaming? Actually just had a similar question like this pop up. MacBook computers are great for productivity work. They’re great for Adobe products and being able to zip through rendering and what not. But when it comes to gaming, it doesn’t even compare to a desktop like this. The main reason is because of the video power behind a gaming desktop versus a MacBook. MacBook focuses on productivity and has the processing power for gaming but it doesn’t have the dedicated video power like a gaming desktop has. This is exactly what my oldest son wants. I know that you can build these computers, but it makes more sense to me to buy pre-made at this point. My son isn’t quite at the point of building his own, but he needs a serious computer for his Youtube gaming needs. Thanks for this review. No problem! This rig is ideal for content creation as well as gaming. It’d be perfect for starting up a YouTube gaming channel. Thanks for a great review. I’m currently searching for my next machine and appreciate the honest review. I am trying to get a trade off between a work computer and one I can still use for gaming. The best of both worlds but on a budget! Yeah I know kinda difficult. You mention the i5-8400 probably isn’t the best for streaming, just wondered which processor you would recommend? I’m not sure I want to put together my own but perhaps to get the sort of machine I am after for the money I might have to consider it. Or do you have a recommendation for a more suitable pre-built PC for graphic design and video editing as well as gaming but not on the high end of the price range? Your thoughts appreciated. As far as programs such as Photoshop go – this PC would be able to handle it just fine. The i5-8400 compared to say any of the newer or older gen i7 processors would be a bit faster rendering speeds while trying to render certain graphic processes and what have you. It’s not the most optimal processor for it but it’s definitely more than enough to get the job done, with streaming in mind as well. If right around $800 is your budget and you’re looking for something pre-built that’s fast enough for productivity purposes while also being able to game well at 1080p then this is it! This is a great review, Honestly I thought the days of gamer PCs were history but obviously they aren’t. With all the gaming consoles now they must be a bit less. I just asked my son and he said its better because for him its the best of both worlds cause he can play games and still have the computer for all the computer needs and he told me about this PC. The opposite is actually more true. Computers have come a long way and they have a lot more power behind them than say a Xbox One or a Playstation 4. You not only have more power to run games more smoothly but you have the freedom of having a computer at your disposal as well. This PC is definitely more than capable for games such as the new Black Ops! It’s ideal, especially for those that aren’t trying to build their own rig but want to spend around $800. Perfect for 1080p resolution gaming. As I don’t know how to put together a computer from scratch I think this cyberpowerpc is what I’ll need next time I need a new one. You say the performance is good enough for all 1080p/60 FPS games and this is all I need. I will look at your $800 self build guide before I buy but that is probably too risky for me and I’ll choose the convenient option. This sounds like the perfect rig for you then. You’re only paying around ~$50-$80 more for having it built for you and it’s usually a lot more than that compared to other companies that provide pre-built computers. I’m glad that you enjoyed the review! I have loved computers and used computers for as long as I can remember. Through the years I’ve learned how to install different types of hardware into my computers, but I never had the confidence to build my own. Just recently my nephew had one built for him by one of his friends, and it only costed him around $700. The computer itself is one of the best gaming computers I’ve seen, and it looked pretty easy to assemble. Your article has helped me find the necessary parts that I need to put one together. 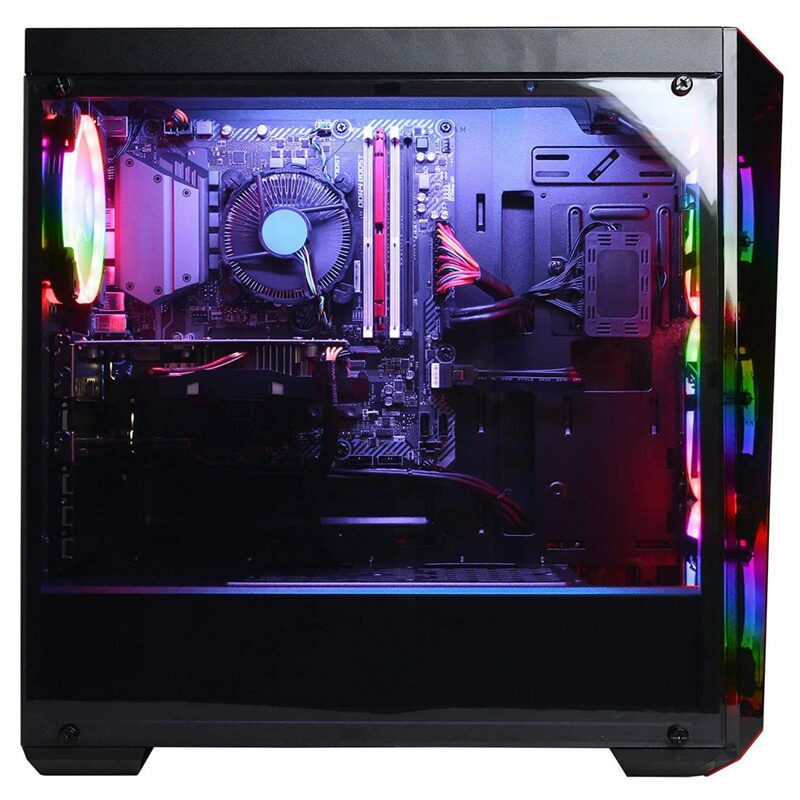 I have always dreamed of having computer that was great for gaming, and appreciate that you gave an in-depth description of all the components thats needed to put a computer together. I’m happy to hear that you’re digging the site! It’s nice to put your own together, a lot of fun too! Pre-built options are all over the place but 9 times out of 10, it’s cheaper to go the route of putting your own rig together.